F. Silverman Jewelers is excited to be a part of The Holiday House Tour, held this Thursday, November 17, from 9:30 a.m. – 4:00 p.m. 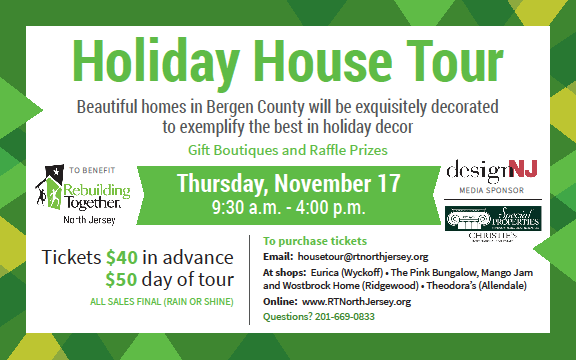 This fund-raising event, organized by Rebuilding Together, will feature a leisurely tour of five exquisite homes decorated for fall and winter holidays by some the region’s most gifted designers. With the holidays just around the corner, the tour also offers opportunities for some boutique shopping! All proceeds will benefit Rebuilding Together’s mission of healthy and safe housing for low-income residents throughout Bergen and Passaic Counties. The Holiday House Tour promises to delight as visitors tour magnificent estate homes located in Saddle River, Upper Saddle River and Wyckoff. One of the homes belongs to nationally-renowned celebrity! The tasteful autumn and holiday décor may even inspire your own decorating choices this season. Tickets are just $40 in advance (or $50 at the door), available at Pink Bungalow, Mango Jam, and Wostbrock Home in Ridgewood; Theodora’s in Allendale, and Eureka in Wyckoff. You can also purchase your Holiday House Tour tickets online, and pay with a credit card or PayPal. Founded in 1998, Rebuilding Together is a volunteer-driven organization dedicated to enhancing the lives of low-income homeowners in Bergen and Passaic Counties. With the assistance of corporate and individual donors, community organizations, and the volunteer work of individuals and skilled tradesmen, the organization helps disadvantaged residents by making their homes and communities safer. From plumbing and electrical work, to making in-home modifications for disabled elders, Rebuilding Together provides critical home repairs free of charge with the vision of a healthy and safe home for those who need it most. F. Silverman Jewelers in Montvale, NJ, is a proud sponsor of Rebuilding Together, and remains committed to the well-being of Bergen and Passaic County residents. For more than 20 years, this family-owned business has been actively involved in charity events and organizations designed to enrich the health and lives of our community. This holiday season, we invite you to shop our carefully curated selection of diamonds, fine jewelry and gift items.